Remember that Comcast customer service call we posted last week? Comcast admits its policies are to blame. 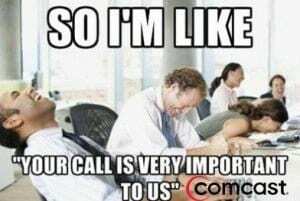 Comcast isn’t known for being the best in customer service. In fact, after last week’s customer service call with Ryan Block and his wife went viral, I’m pretty sure most people will be steering far and wide of Comcast’s services in the future. It may be too little too late, but Comcast has recently announced that it will be reexamining its customer service policies, which are currently focused on keeping subscribers from leaving–even if that means harrassing them. Those who work in customer service probably understand the agent’s determination in keeping the subscriber. Most agents’ paychecks come from the number of customers they lose and how many are kept from leaving. What do you think? Is Comcast doing too little, too late?